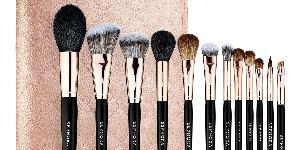 Contest: WIN: Beautiful Sephora PRO Rose Gold Brush Set + Pouch! WIN: Beautiful Sephora PRO Rose Gold Brush Set + Pouch! Prize: Sephora PRO set of Rose Gold makeup brushes, including an easel stand built into the brush pouch. This curated set of 12 Sephora Collection PRO Brushes, an easel stand built into an on-the-go, zip-around pouch. Statistics: This contest was opened by 158 and entered by 25 ContestChest.com members. 16% of those who opened the contest, entered it.